I can’t really argue with him – office culture is not the most welcoming environment for exotic new recipes. In fact, people in general can be incredibly wary of trying new things (I should be looking in the mirror as I say this; I’m sure Morgan will be incredulous that I’m even suggesting that I’m outside this category). I remember a number of birthday parties growing up where my mom would amass enough food to feed an army, an assortment of all my favorite things including an amazing sherbert punch. But the sherbert punch contained a lot of different ingredients along with scoops of rainbow-flavored sherbert that would float to the top – this was clearly not Kool-Aid. And so the punch would go untouched. Hmpf, kids! But I just couldn’t bring myself to make a chocolate chip cookie or basic brownie recipe this week. This week is different! Historic and amazing things have happened in my home state of Virginia and across the country. Electricity is in the air. If anything is possible, then maybe Morgan’s office will accept something ever so slightly off the beaten path? 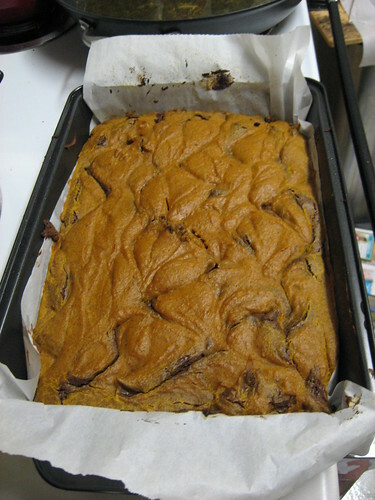 I kept coming back to two recipes: Chocolate-Pumpkin Brownies from RecipeGirl.com and Pumpkin Swirl Brownies from Smitten Kitchen (though I have to be honest, even I am almost pumpkined out for the season). 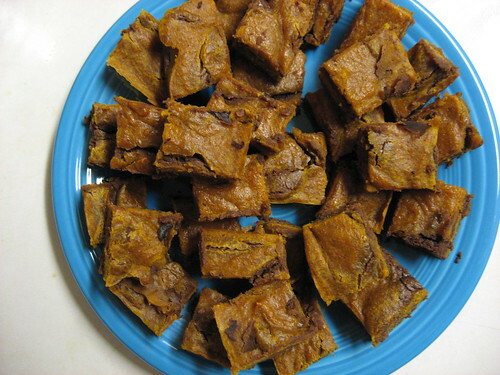 The RecipeGirl brownies looked more chocolatey and had less pumpkin and pumpkin spices, and the Smitten Kitchen recipe looked great but Deb seemed a little unsatisfied. 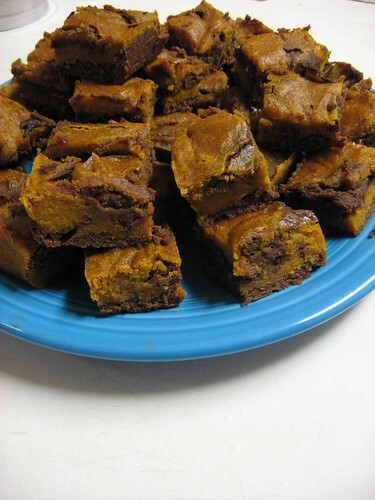 I decided to compromise and try to incorporate the best of both pumpkin brownie worlds. Deb at Smitten Kitchen said she kept wishing her brownies were either all chocolate or all pumpkin and the RecipeGirl brownies looked more chocolate than pumpkin. I tried to change the recipes so that one taste might slightly overpower the other. Being that I love pumpkin, I added a whole can of pumpkin along with cloves and more nutmeg. Sometimes I think brownies run the risk of being a little bland, but adding the extra spices really kicked them up a bit. I liked them even better after they set overnight. Deb also described her chocolate batter as being too thick. To smooth it out and make it more pourable I included 1/2 cup of cream cheese. It was certainly not as thin as the pumpkin batter, but it did help. I also used a 13×9 pan to keep the brownies from being too enormous and thick. Update – Success! Morgan said these brownies were scarfed down at his office in no time. Preheat your oven to 350 degrees. Grease a 13×9 baking pan and line the bottom and two sides with parchment paper. Grease the paper as well. 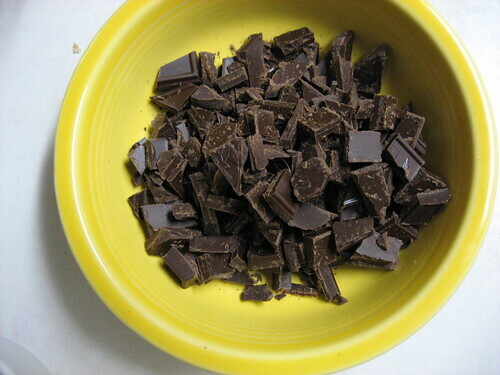 Melt chocolate and butter in a microwave safe bowl for 50 seconds; stir to incorporate fully. Whisk together flour, baking powder, cayenne, and salt in a large bowl. Set aside. Combine sugar, eggs, and vanilla in the bowl of a stand mixer (or use a hand held mixer if you don’t have one). Beat until fluffy and pale yellow, approximately 3 minutes. Beat in flour mixture in two parts. Pour half of your batter(about two cups) into a separate bowl and stir in the chocolate mixture. Add the softened cream cheese and stir unti combined. In the other bowl, stir together pumpkin, oil, cinnamon, nutmeg and cloves. 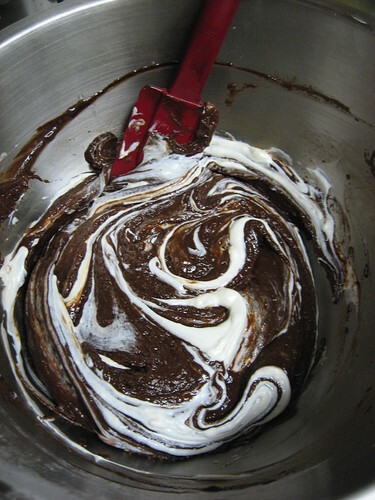 Transfer half of your chocolate batter to the prepared pan and smooth and level with a rubber spatula. It will be relatively thin. Top with half of the pumpkin batter. Repeat with another layer of the chocolate batter followed by the last layer of pumpkin. You have to work relatively quickly to keep the batter from setting. With a butter knife, marble your two batters – make sure you take the knife all the way down to the bottom of the pan. Bake approximately 27-30 minutes. Let cool on wire rack, then remove brownies by lifting parchment paper and cool completely on your wire rack. I have made those black bean brownies and can testify that they are quite awesome. But Chef Edwin, why didn’t you make them for me?! And, ahem, I believe you owe me a cake!